All cottages have refrigerators, stoves, pots & pans, coffee makers, clock radios, dishes, & Gas BBQs. Bring your own towels, toiletries & garbage bags. T-towels & dish detergent supplied. Bedding provided upon request. Summer rental is weekly only. Check-in Saturday 4:00 PM, check-out Saturday 10:00 AM. Minimum 3 night stays over long weekends. Minimum 2 night stays during other times. Shorter stay rentals available on a last minute space available basis only. 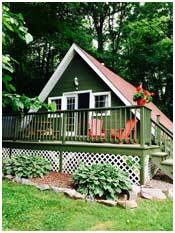 Rates are based on recommended maximum cottage capacity as listed above. Some cottages have pull-out couches. Adherence to maximum cottage capacity rule is mandatory. DEPOSITS: 25% deposit required on all weekly reservations, shorter stays require deposit equivalent to first night's rate. Refund schedule: Please see your invoice for a detailed explanation of our refund schedule. No adjustments for late arrival or early leaving. $20.00 charge on NSF cheques. Cheques for final payment must be received at least 30 days before reserved date. No confirmation of reservation without deposit. Rates subject to change without notice. WATERCRAFT: Watercraft is generally available from May 15-October 15. Release of watercraft is subject to water temperature considerations. Earlier or later dates may or may not be available. Sorry, the Township of Seguin has banned the use of personal watercraft (ie. Sea Doos, Jet skis, Waverunners etc.) on Silver Lake effective January 1, 2010. Boat rentals available from Gordon Bay Marine. All boaters must adhere to new federal navigation laws. In July and August the Check-In time is 4:00pm and the Check--out time is 10:00am. Any check outs after that time will require full payment for an additional day. During off season and long weekends (other than summer) check in and out times may be more flexible. Quiet time is from 11:00pm – 8:00am. Excessive noise or unruly behaviour is not permitted at any time. No pets are allowed at any time. Kennels are available in Parry Sound. Smoking is not permitted inside the cottage. Please use outside cans for cigarette butts to help keep the grounds clean and so children don’t pick them up. NO LIFEGUARD ON DUTY AT ANY TIME. No glass allowed on the beach. No overnight visitors allowed. Owners must be informed of all visitors. Cottage renters and visitors must not exceed cottage capacity. Tents, trailers or any sort of camping is not permitted on the Silver Lake Cottages premises.